Zimmer Spine, a provider of musculoskeletal health solutions, has launched its Puros demineralized bone matrix (DBM) block and strip in the US, designed to stimulate natural bone formation processes in spine surgical procedures. Puros DBM Block and Strip are composed of fully demineralized cancellous bone and are used during surgical procedures to help promote bone growth and joint stability. These allografts are ideal natural scaffolds for new bone growth because they are processed to retain osteoinductive properties by preserving endogenous growth factors including BMP2, BMP4 and BMP7 to help support new bone formation. According to Zimmer Spine, Puros DBM allografts when used alone or as a bone graft extender provide osteoconductive and osteoinductive properties, improved handling and excellent graft containment in a ready-to-use application. Once rehydrated, Puros DBM block and strip are flexible and compressible. They are available in a variety of sizes and shapes to reduce transplant preparation time. Zimmer Spine president Steve Healy noted these new Puros DBM products minimize the need for shaping during the surgical procedure, are provided sterile, and have up to five year shelf life. "Adding these new DBMs to our biologics portfolio will provide surgeons with a competitive, off-the-shelf, and convenient allograft at a good value to the hospital," Healy added. Zimmer Spine is providing Puros DBM block and strip through a partnership with AlloSource. 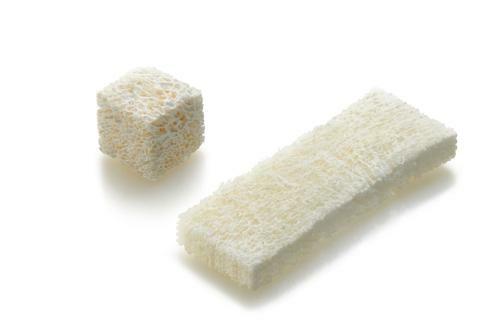 Image: Zimmer Spine’s Puros DBM block and strip for stimulating natural bone formation processes. Photo: Courtesy of PRnewswire/Zimmer Spine, Inc.